Great race today in Grant, Alabama. Chris Cundiff organized a race billed as “The Race of the Falling Leaves” in tribute of the race of the same name held today in Italy around Lake Komo. The race held up to its name as there were literally leaves falling as we raced three times up the mountain where the town of Grant is located. I ended up edging out Mike Olheiser in the final sprint to take the win. Here’s all the data! 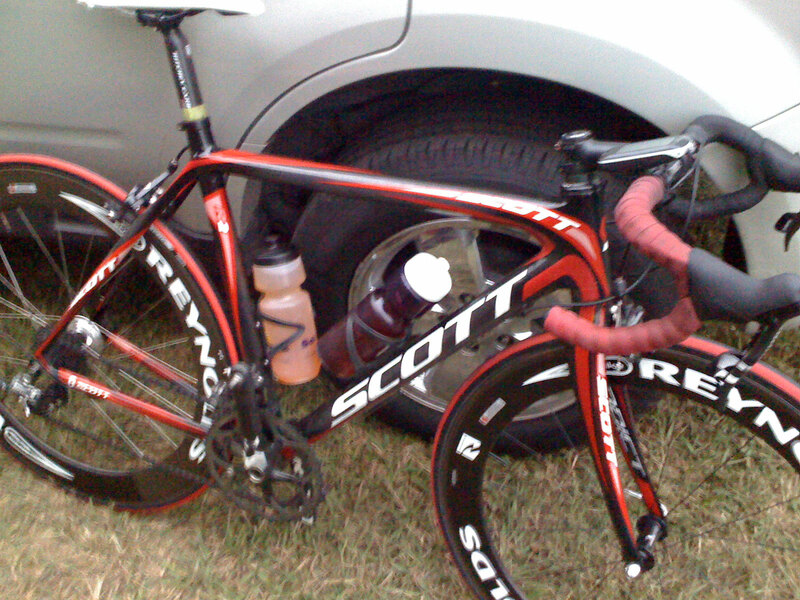 This entry was posted in Racing and tagged podium, road race on October 15, 2011 by kartoone. Awesome ride. I was aiming for about 9 hours on this ride (wall-clock time), but I ended up flatting in the middle of a KOM attempt on Sassafras only 50 miles into the ride. I spent 30 minutes changing the tire trying to inflate with a tiny mini-pump and could only manage to get the tire to hold maybe 60psi. 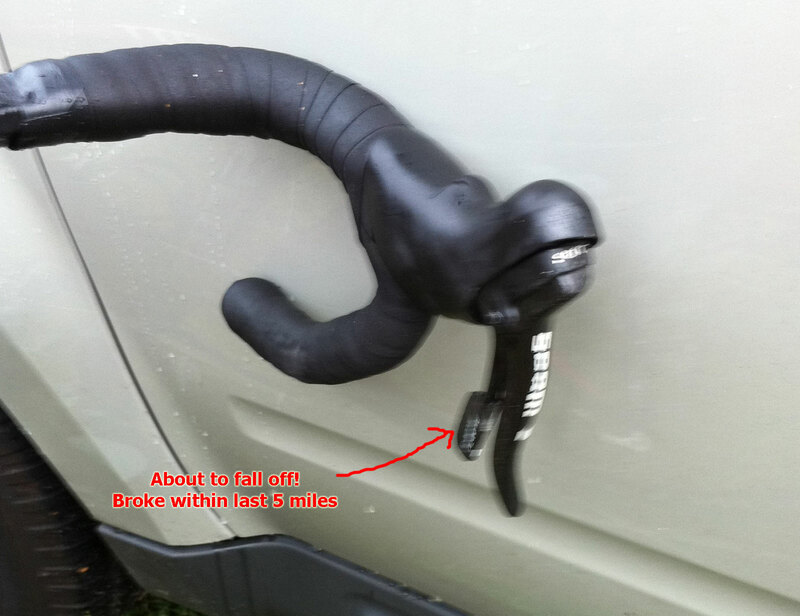 But amazingly, it held for the rest for the rest of the ride with no pinch flats. I was a little bit more cautious on the descents for fear of a sudden pinch-flat blow-out, or rolled tire so I ended up finishing the 163 mile ride in about 10 hours, 15 minutes. Beautiful fall colors. There was one overlook near the top of the 215 climb where you could see straight down into the valley and could see the different levels of “color change” in the leaves based on elevation. It was awesome. I saw lots and lots of wild turkeys on the Sassafras climb. With the tire change, I spent nearly two hours on the mountain and did not see a single other person/car. On the way back down, I ran into the back of a turkey, taking feathers to the face, after startling it on the side of the road. It flew into the road and up in front of me. For a split second, I thought for sure that I was going down, the turkey was soon to be dead, and the ride was done. Instead, the turkey just barely cleared me brushing my face and helmet with its tail feathers as it gained enough altitude for me to go under. North Carolina has amazingly smooth roads. 215 was perfect. The bottom of 215 with its rolls and twists was probably the “road highlight” for me. Extreme winds across the ridges on the parkway. I would guess that there were 40-50mph gusts across the ridges. I was lucky with my deep dish racing wheels not to go down. 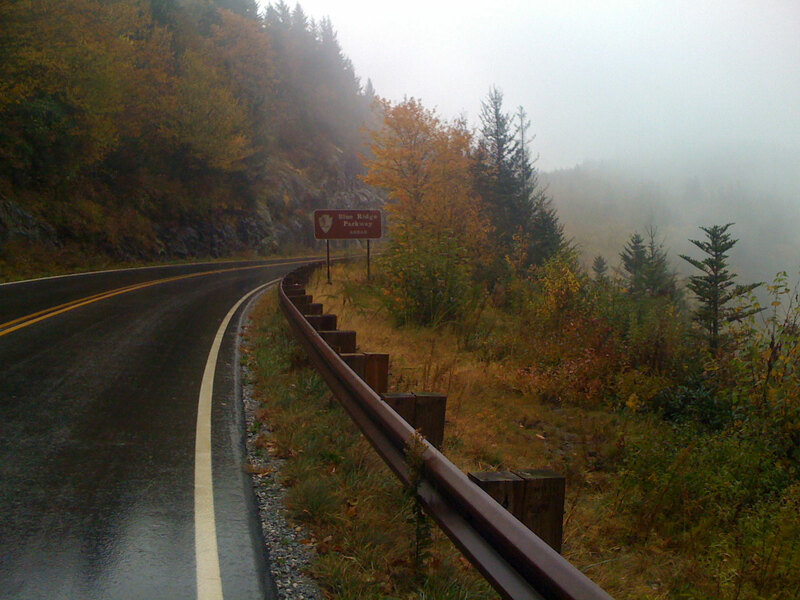 The last mile or two of the 215 climb plus all fourteen miles (round trip) that I spent on the parkway had a temp of 47-50degF with light drizzle, lots of fog (i.e., riding in the cloud layer), and amazing winds. I tried to push 225-250 watts on the uphills and over 200 watts on the downhills to stay warm in just shorts, short sleeves, and sleeveless rain vest. $1.59 pizza/coke after school special at the Salem gas station. I was down to $2 so this worked out really well. 1 large slice of pepperoni/sausage pizza and 1 twelve oz can of coke was perfect to get me the last 20 miles home. The final ride highlight was making it back to the farm having completed the ride that I thought was doomed when I hit the rock climbing Sassafras and pinch flatted my rear wheel. 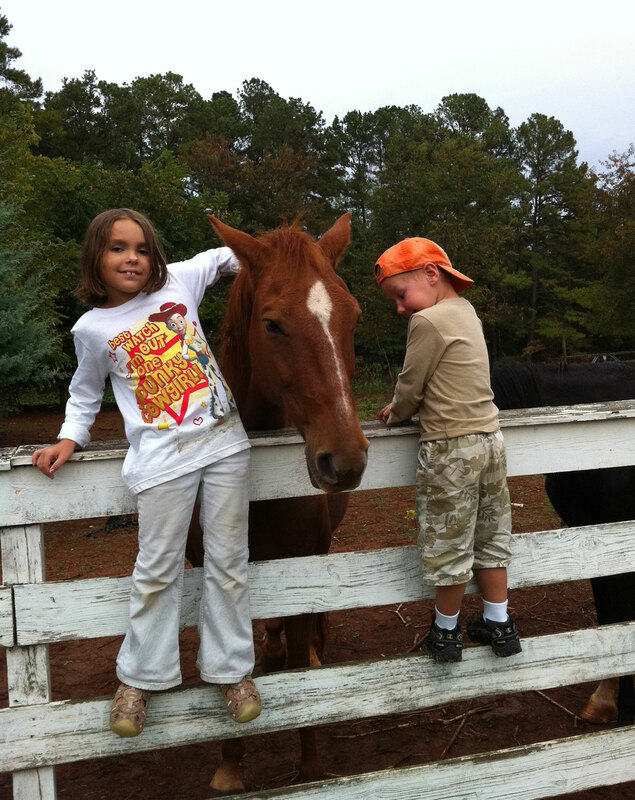 And then to have Kristine and Analise out on the deck of the cabin watching for me and then seeing Analise and Josiah playing with the horses … well, it was the perfect end to a great day. What a way to end an over-the-top season – with an over-the top epic ride of 163 miles! 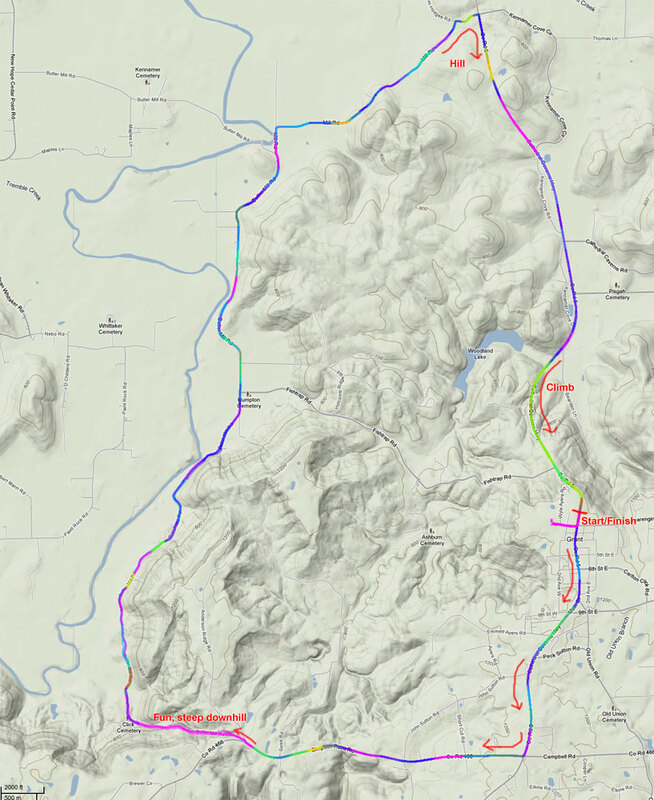 I planned out this ride a few weeks ago thinking originally that I would combine the Sassafras climb with the Highlands route for over 130 miles. But while playing around with topocreator to make the route, I realized that I could substitute the 215 climb up to the Blue Ridge Parkway instead of Highlands and then continue climbing up to the highest point on the parkway (6053′). It would stretch the ride out over 160 miles, but I knew immediately that this was the ride I wanted to do. 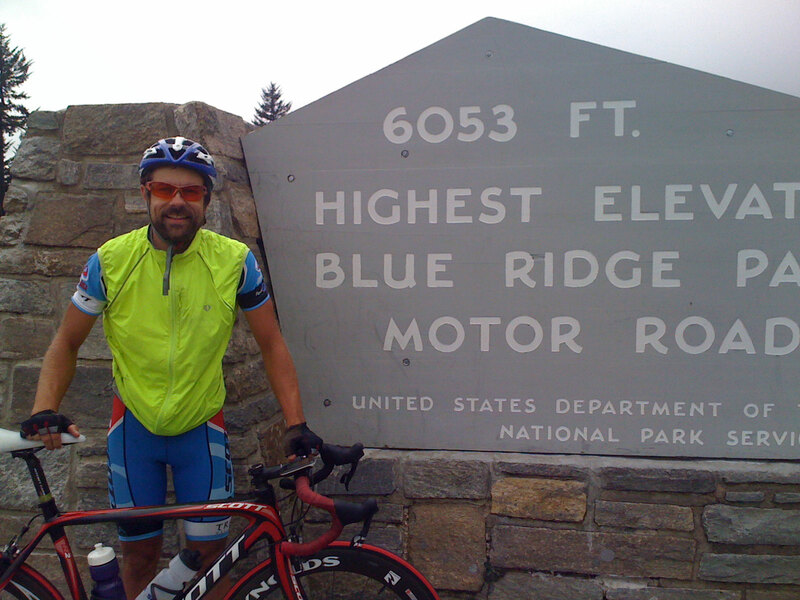 About 15 years ago while I was a student at Clemson, I tried twice to ride from Clemson out to the Blue Ridge parkway and back, but failed both times — once making it all the way to the 215 climb but having to turn around unable to complete the climb with my back giving out. Fast forward fifteen years to Fall 2011, and we’ve had nearly two weeks of perfect weather across the Southeast so approaching Fall Break I knew that the odds of continuing the good weather streak were low. 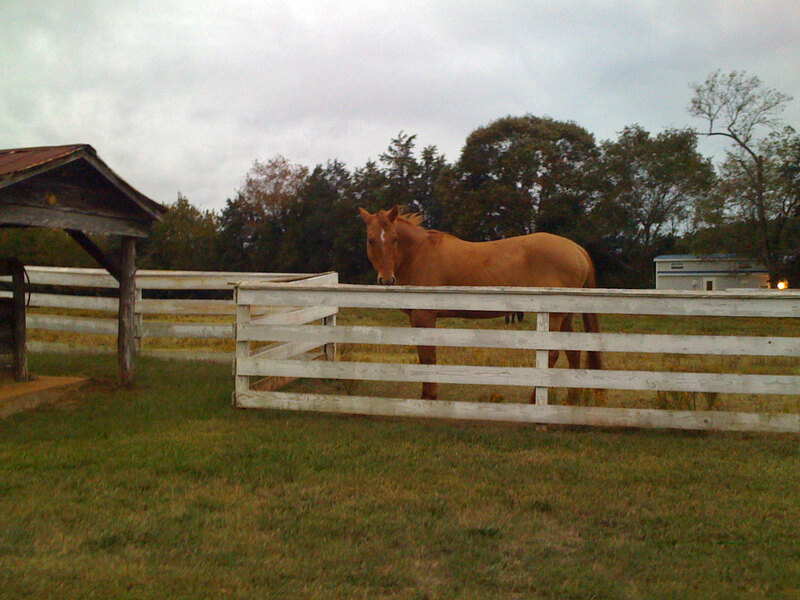 Sure enough, I felt the first rain drops as I was leaving the driveway of the Fieldstone Farm Bed and Breakfast (awesome horse farm we visit every fall break). Even with the overcast skies, it never really started to rain until I was on the 215 climb up to the Blue Ridge Parkway over four hours later. 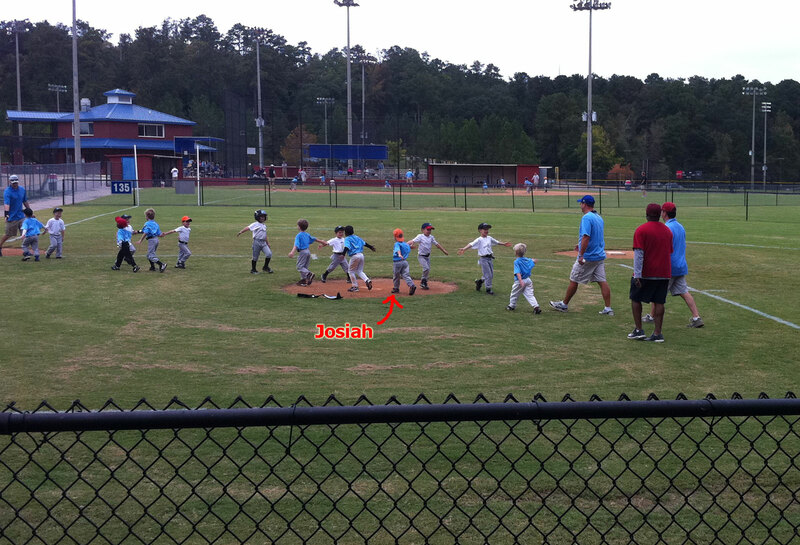 We changed our plans last minute to stay for Josiah’s baseball game, so we didn’t end up leaving until sunday right after his game. 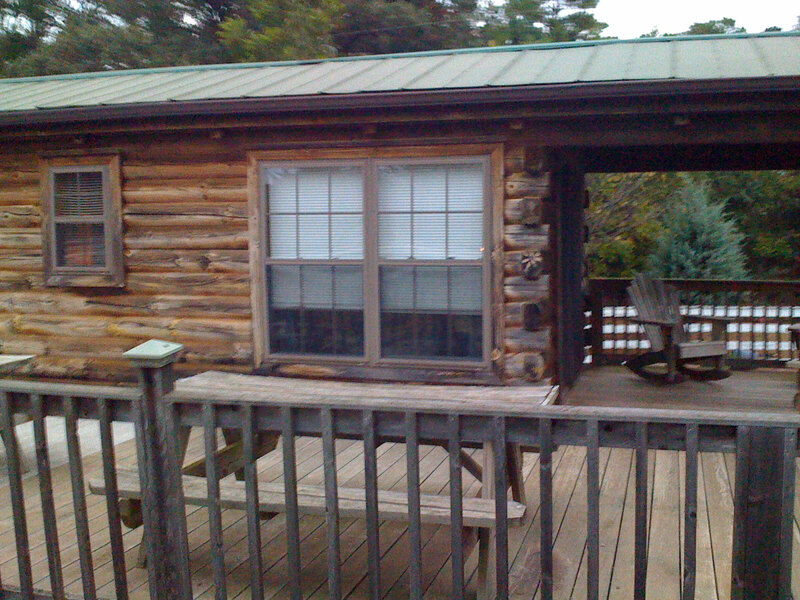 This put us into Fieldstone Farm pretty late combined with the 1 hour timezone change meant that when it was still dark outside at 6:30 eastern, we kept right on sleeping. 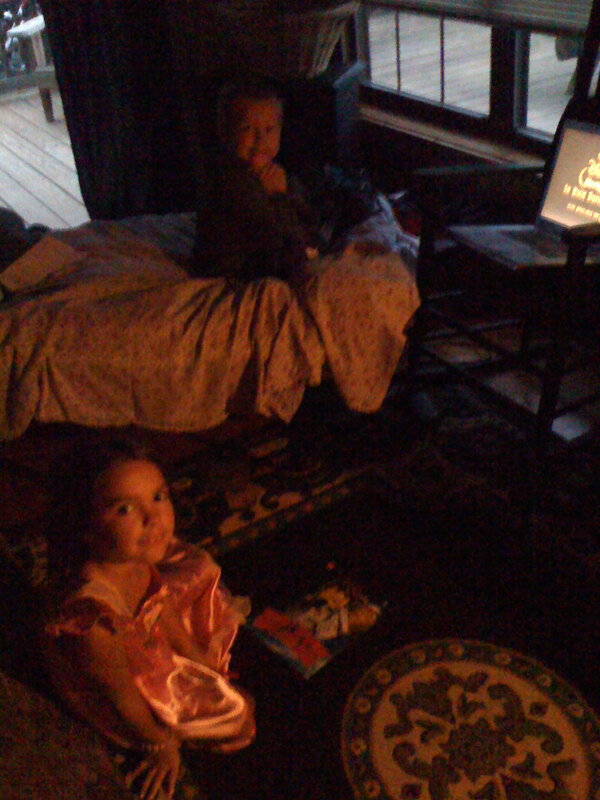 Still, I made it out the door by 7:30 or so with the kids set up to watch a movie. The ride out to the mountains was great. Even with a few rain drops and threatening skies, it was still clear enough to see the dark blue outline of the blue ridge mountains. I made it out to the Eastatoe Valley and hit the Dug Mountain climb at 275 watts to try to set the KOM on it without digging too deep. I went easy up the climb out of the Eastatoe Valley and all the way to the top of Beasley Gap on 178. 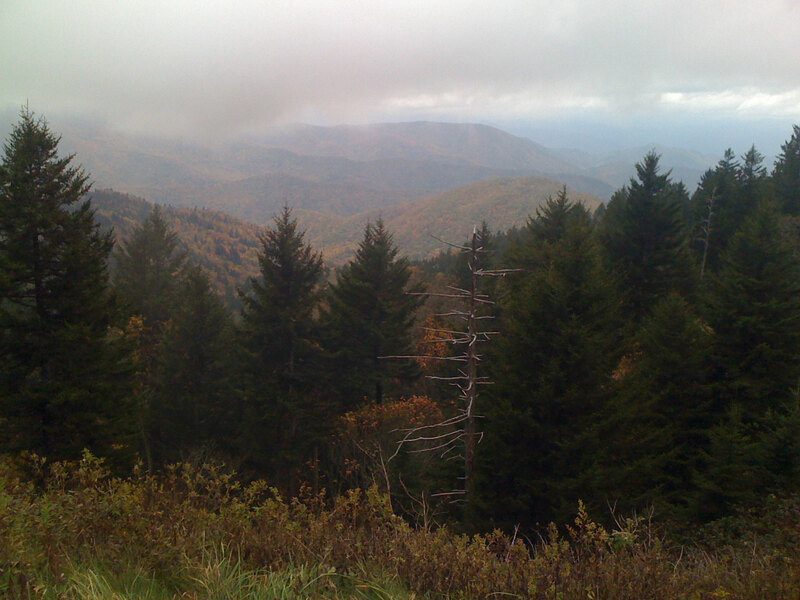 I had my eyes on the Sassafras Mountain KOM. I knew that I still had well over 100 miles left in the ride, so I was aiming for the 280-290 watt range for the nearly 5 mile climb. I was over halfway up it and enjoying chasing the turkeys out of the road on the climbs … they would fly up the road and then land again 1/2 mile ahead. It was a good distraction because I was pushing it hard with a 290 watt average 3 miles into the climb when I was looking down at my GPS to see my current wattage for the climb when I came across some large gravel rocks washed onto the road. I hit one of them hard and immediately pinch flatted. Doh!!!! I realized a couple things very quickly – 1) my attempt at the KOM was done 2) if I didn’t get the tire changed I was in for a long walk back to civilization. I had everything I needed to change the tire, except for the cO2 cartridge that goes with my mini-pump. Without the CO2 cartridge, I wasn’t sure if I would be able to get enough air into the tires having to send the air through the valve extender through the deep dish rim. Fortunately, it worked, albeit very slowly. At one point, I laid down on the road with my helmet still on and pushed back as a head rest, with the tire propped up on my knees and pumping on the tiny pump for several minutes. I would count to 100, rest, and then try some more. I think I eventually got somewhere between 60-70 psi into the tire. 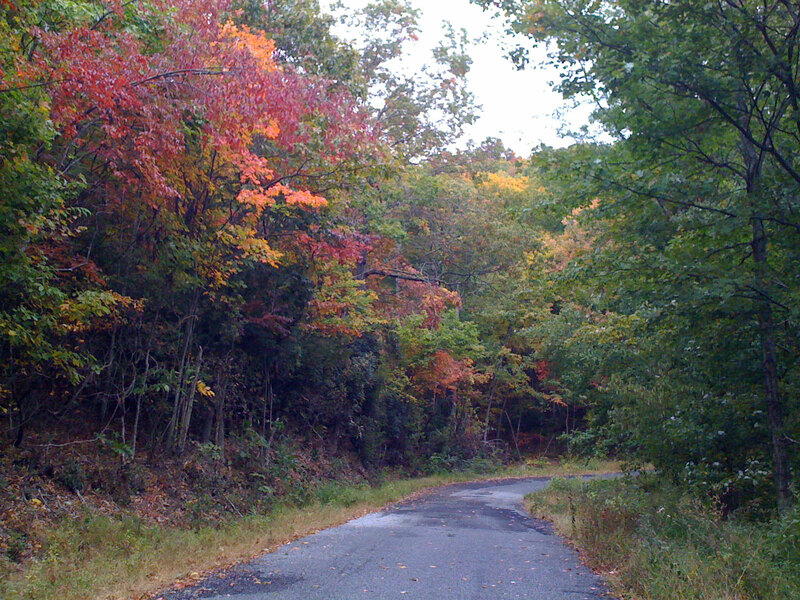 At least it was pretty up on Sassafras Mountain while I was changing my flat tire. 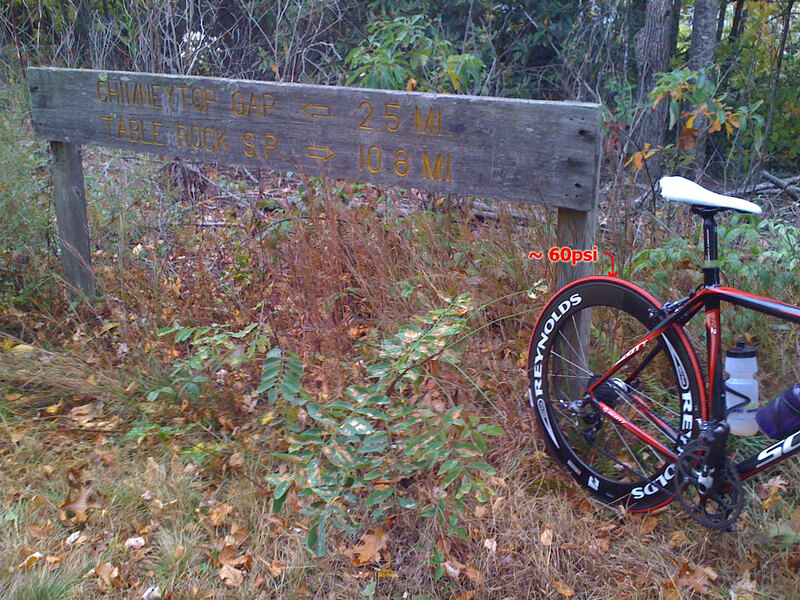 After finishing the climb to the top, I took a couple quick pictures and then headed back down somewhat slowly to make sure I didn’t have a pinch-flat blowout. It was on one of the steep pitches that I startled a group of turkeys nearly taking out one (see ride highlight section). The bottom part of Sassafras has been repaved so starting to get a little bit more trust in the tire, I went ahead and let go of the brakes hitting 54 on the steep section below Chimney Top gap. Oh and I forgot that I almost hit a squirrel through here going 54. That would not have been good for me, the squirrel, or my squishy rear tire. 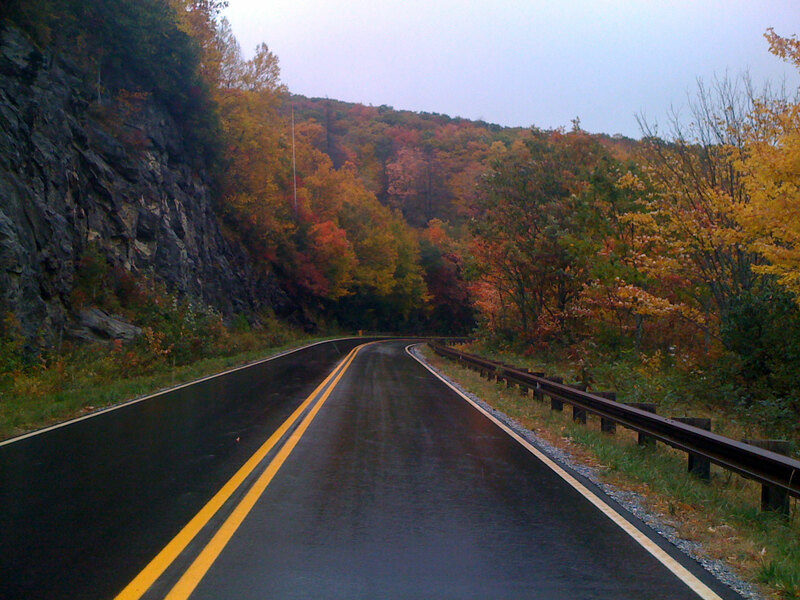 Rainy, foggy, cold – finally, the Blue Ridge Parkway! 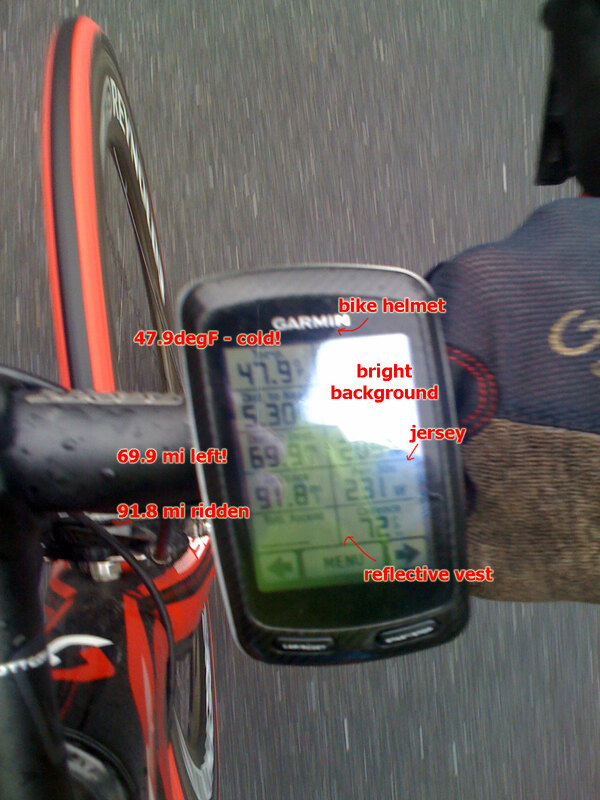 The Garmin was really helpful as it counted down the miles to my next turn, which I knew would be the parkway. This helped me make it up the long steep 215 climb. Then, once I was on the parkway, my Garmin counted down the miles to my turnaround spot at the high point on the parkway. I had to keep pushing hard to stay warm, but my legs were getting tired. Eventually, I made it. I asked a motorcycle rider to take my picture at the top. I took one picture looking off the side, and then I started back down. Squishy rear tire, high winds be damned as I was now tired, hungry, and cold. 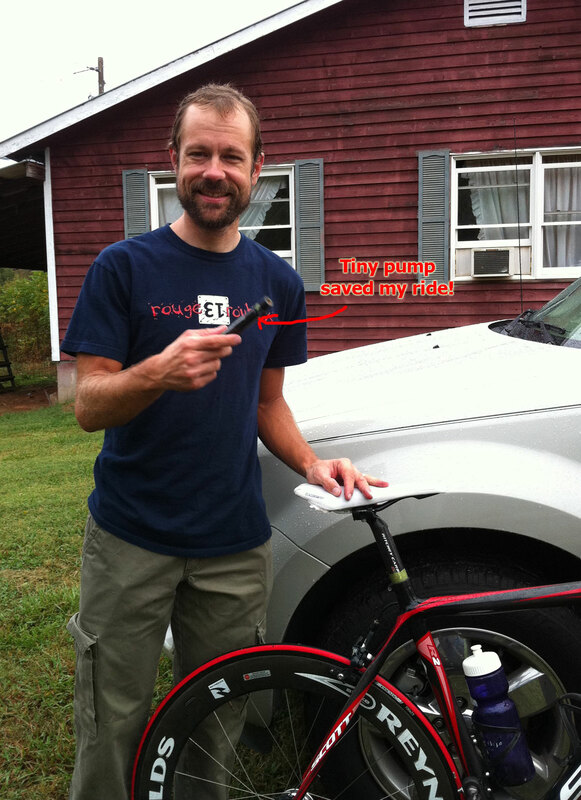 I drilled it on the descents on the parkway and made great time back to 215. My philosophy has always been this — if you are cold, then you need to ride faster! This didn’t work well on 215 though as it was raining heavier there and the road was twisty with LOTS of leaves on the road from the high winds. I had to brake a lot and would have gotten dangerously cold, except it was amazing how you could feel the temperature increase on the descent. It was well into the upper 50s by the time I made it back to Balsam Grove for a very important refueling stop. I chatted with the gas station clerk, who was also a mountain bike rider, as I ate a sausage, egg, and cheese biscuit and loaded my bottles with a 24oz coke and 20 oz gatorade. By now, it was 3:30PM with Kristine expecting me back by 4:00. I still had over 50 miles to ride and no cellphone reception. 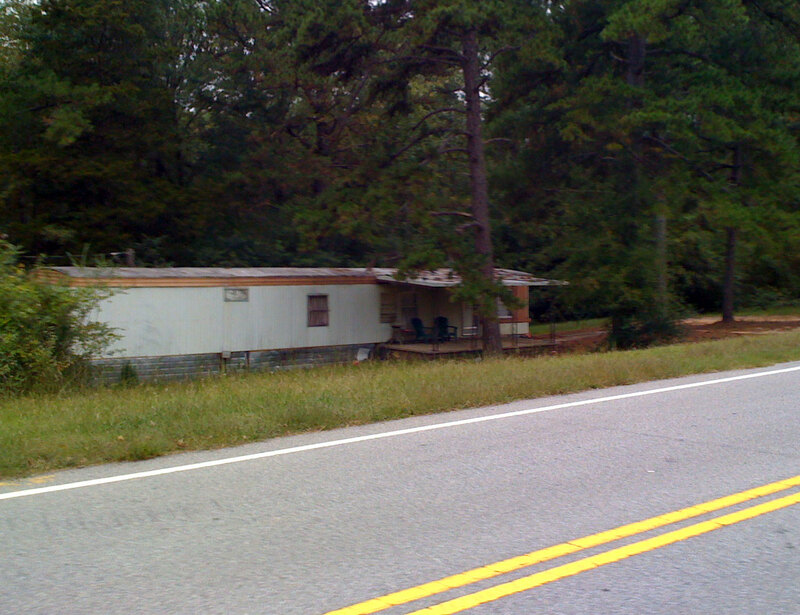 But on the top of one of the climbs on 281, I had enough reception to call her and leave a message that I wouldn’t be home until 6. She got through to me a little later once I made it over to Sapphire and helped talk me through a couple of the climbs leading into the Whitewater Falls descent. The Whitewater descent was supposed to be a late-ride highlight, but the road was really crappy immediately after you hit the South Carolina border and I couldn’t just bomb over everything with the threat of a rear tire blow-out. So I would say that this was the ride “low point”. It was over soon enough, though, and I made it to Salem where I found a gas station with an after-school special of pizza and coke. This was just what I needed to get me home the last 20 miles. I pushed it hard and had a nice tailwind making it home 10 minutes before 6PM. Done! Kristine and the kids were waiting for me when I got home. After cleaning up and right before heading to dinner, I had Kristine take a picture of me holding my little mini-pump that saved the ride. With less than five miles to go, I broke my front shifter and rode the last few hilly miles in my big chainring. 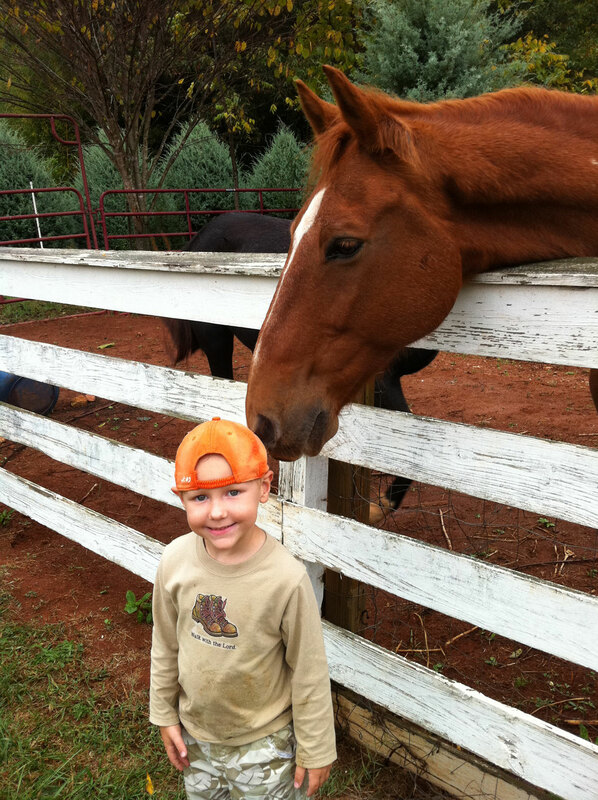 I think the horse must have thought that Josiah’s hat was a carrot. 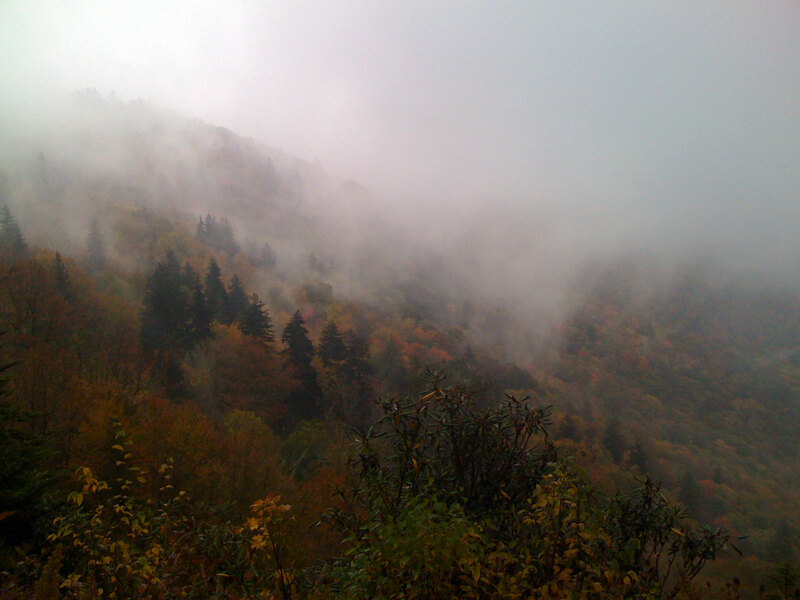 This entry was posted in Training and tagged clemson, epic, mountains, photos on October 11, 2011 by kartoone.